She was last seen wearing a turquoise sweater with a bear on the front, off-white or khaki pants, and pink tennis shoes. Unknown. 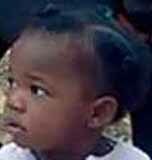 She was last seen by her family playing outside her home between 10:30 a.m. and 11:00 a.m. Few details are available in her case, which remains unsolved.